It is generally conceded that the Civil War was the defining event in this country’s short but eventful history, its bloody legacy reaching even into our own day. Commemorated in story and song, on film and yearly re-enactments in certain areas of the South, it’s a wonder that it wasn’t made into an opera until now. Enter Philip Glass, that contemporary master of minimalism, to spread the sprawling tale of the conflict between brothers that claimed some half-a-million lives across the stage. “Appomattox,” named after the small town where the peace finally was made, was commissioned by San Francisco Opera in first-term general director David Gockley’s initial solo flight. And indeed it soared in most places and fell with a thud of tedium in very few. Glass’ music – not the highly repetitive mesmerizing music of his earlier “Satyagraha” and “Koyaanisqatsi,” but the more tuneful, varied work of his more recent film scores for “The Hours” and “The Illusionist,“ supported the vocal and dramatic lines beautifully. 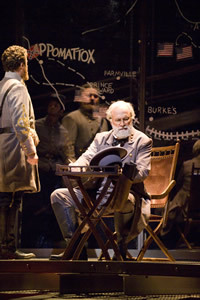 Indeed, “Appomattox” tends to unfold with a certain cinematic swiftness; short scenes and flash-forwards abound. Glass also makes skillful use of anthems, spirituals and marching songs of the time, intercut into the score. Famed conductor Dennis Russell Davies wrung every nuance from the orchestra and the voices – dominated by the young singers of the Adler Fellow training program — were fine. Dwayne Croft was outstanding as the dignified but defeated Robert E. Lee, with a bravura star turn late in the game by Philip Skinner as an unrepentant Edgar Ray Killen, relating his part in the brutal murder of three civil rights activists. Where “Appomattox” occasionally faltered was in Oscar and Tony Award-winner (“Dangerous Liaisons,” “Sunset Boulevard”) Hampton’s words. Sometimes highly poetic (“he stepped into the morning”), they became repetitive (the line “war is always sorrowful” is ubiquitous). At moments of particular poignancy and high drama like, when a chorus of refugees fleeing the siege of Richmond witnesses the city being blown up before its collective eyes, Hampton gives them nothing to say but “Ah,” repeated ad infinitum. Yes, words may fail but surely he could have found a few. War – at least in those days – was men’s work but this opera begins and ends with the voices of women. Adler Fellows Rhoslyn Jones (Julia Grant), Ji Young Yang (Mary Custis Lee) and Heidi Melton as the neurotic Mary Todd Lincoln lament the burden of the war on their husbands and the entire nation while a grieving female chorus places pictures of the dead on the stage. At the end, the women reappear and put an apostrophe to the whole thing as a general anti-war statement that resonates in our own time. “What has occurred will ever reoccur.” In between, there are the peace negotiations, kept from tedium by injections of harrowing events in the near and far future, KKK lynchings, mob looting, and Skinner’s defining narrative, delivered from a center-stage wheelchair. Other prominent roles were taken by Andrew Shore as Ulysses S. Grant, a rough-hewn foil to Croft’s genteel Lee; Jeremy Galyon, a dead ringer for Honest Abe and Kendall Gladen as Mrs. Lincoln’s freed-slave maidservant Elizabeth. (The last two also from this year’s astonishingly talented crop of Adler Fellows). The austere, strikingly modern set of black and bronze doors against a blood-red background in Act One, with a house and hanging cadavers of horses superimposed for Act Two, was done by Riccardo Hernandez and period costumes were by Gabriel Berry. Robert Woodruff directed.